More than two-thirds of marketers (67.5%) say they plan to invest more dollars in display advertising over the next 18 months, and 59.0% plan to invest more in mobile over the same period, according to a new survey from Bizo. Asked to rank their top 3 priorities over the next 18 months, marketers also cite paid search and SEO (55.4%), social media (48.2%), and email (31.3%). 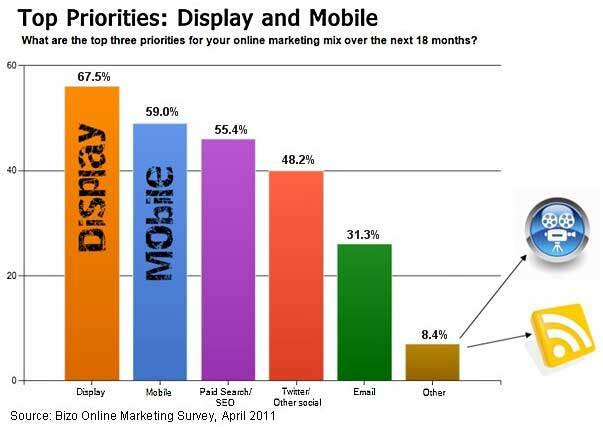 Below, other findings from Bizo's Online Marketing Survey of 130 marketers, conducted in March 2011.